Cracked up last night when I found these two dolls. I picked them up before Christmas as stocking stuffers and wasn't sure which cherub to give them to. I was leaning toward Emie because she's a bit more genteel (shall we say) in her handling of toys. But Ainsley does love a dolly so I hadn't decided. 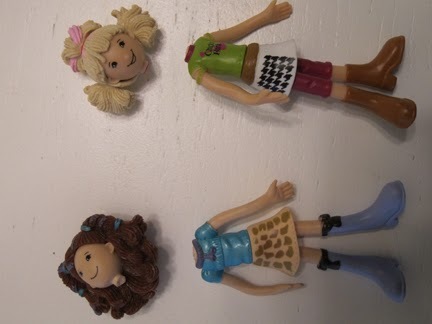 Me: Aren't these the dollys cute? Me: Maybe I should give both of these dolls to Emie instead of Ainsley - she'd love them. Mary: (Ever the advocate of the underdog youngest child) Why not give some to Ainsley so she can also have something special?